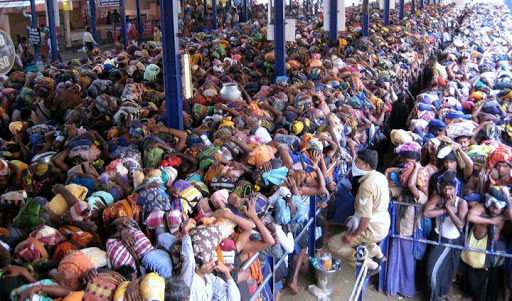 Every millions of pilgrims are arriving to Kerala to darshan lord Ayyappa and the number or pilgrims increasing every year. Because of annual season pilgrims have to stand queues up to 12 hours including senior citizen and children for darshan Lord Ayyappa. Kerala police introduces new system called Sabarimala Virutal Q. Virutal Q helps pilgrims to create a slot by selecting a date and time for their pilgrim. On the selected time they can arrive at Pampa and enter into the direct Queue without waiting much. This will help the devotees to plan their pilgrim time on an advanced basis as per the available slots. Go to official site www.sabarimalaq.com and create new account. Booking application form will open enter the details of the devotee. Select a photo ID type and enter the number of the ID. Upload a photo of the person then click on the Book the Slots button. A ‘Booking Completed’ page be will displayed. Click on the Print Coupon button. An email will also be sent to your email ID. Users can also do group booking by hitting My groups button. At Pampa Kerala Police will verify the Coupon and Photo ID card to ensure that only pre-registered pilgrims are allowed through this Queue. Till you are in doubt for online booking for darshan click here to see detailed explanation in PDF and refer this general FAQ page and also call these numbers 0471 324 3000, 324 4000, 324 5000.